The International Conference for Pharmacy students «Be in Progress 2» took place in the city of Lublin, Poland, from 21 to 25 April 2016. Within the framework of the event, scientists from Medical University in Lublin gave presentations on new trends in global pharmaceutical practice. Undergraduates and PhD students from Ukraine, the Great Britain, Serbia, the Czech Republic and Poland took part in the poster session, where they presented the results of their research. Bevz Olena, Junior Researcher of the Validation and Reference Standards Department at Ukrainian Scientific Pharmacopoeial Centre for Quality of Medicines, PhD student of the National University of Pharmacy (Scientific Supervisor – Leontiev Dmytro, D.Sc.) took part in the event with the poster presentation "Development of methods for determining the Nipazol Pharmacopeial reference standard purity by differential scanning calorimetry" (authors: O.V. Bevz, I. S. Terno, D.A. Leontiev, P.A. Bezugly). 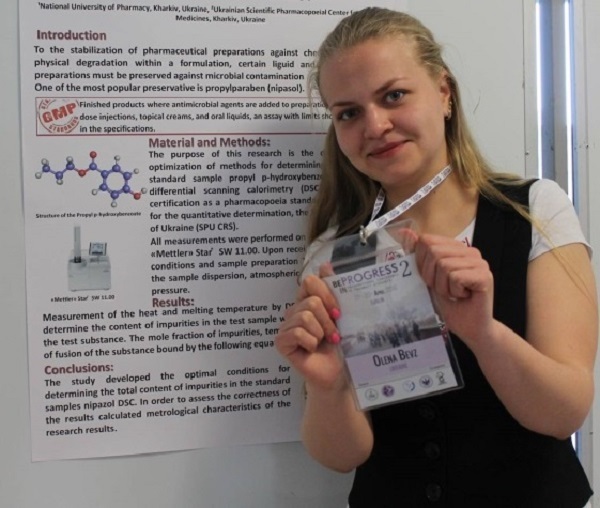 During the conference, workshops were held, where participants, including Bevz Olena, had an opportunity to carry out express tests to detect some substances in biological material and a drink. The tour around the leading pharmaceutical company «ICN Polfa Rzeszów» in Rzeszów, which produces tablets, pills, capsules, syrups, drops, suspensions, sticks and ointments, was organized for participants, where they were able to see the process of drug production in the company and to visit quality control laboratories. At the end of the conference, all participants were awarded certificates and gifts.